Power Rangers is a very popular action TV series featuring a group of costumed teenagers who can morph into superheroes and fight villains using their superpowers. Produced first by Saban Entertainment, later by BVS Entertainment, and currently by SCG Power Rangers LLC, the TV series are based on the Japanese Super Sentai series of shows (produced by Toei Company). The first appearance was in the series called Mighty Morphin Power Rangers in 1993. On this page you will find Power Rangers Games to play online for free. Choose the Power Rangers game that you want to play from the list above. BOOKMARK THIS PAGE NOW so you can easily find our site next time you want to play Power Rangers games online. Power Rangers is an American-Japanese franchise, which was originally popular in Japan. These TV series and games’ heroes originated from some anime series by Sentai. Initially released in the ’90 s as a TV series, the franchise grew and also created the Power Rangers games, popular among so many youngsters. The last season of the Power Rangers TV series was released in February this year. Almost 2 decades of Power Rangers. Power Rangers games were created, as many other games, for Nintendo consoles, Wii and Play Station. Fans can purchase these versions, or can play the Power Rangers games online. Among these games Power Rangers, we can enumerate: Power Rangers jungle fury games, Power Rangers dino thunder games, Power Rangers mystic force games (among the most popular), Power Rangers rpm games, Power Rangers wild force games and Power Rangers ninja storm games. The new concept that they introduce is that of team spirit. Accustomed, until now, with only one superhero, aided by his sidekicks, the Power Rangers games are different. There is a team, whose members depend on each other as to fight against evil. Zordon is a mighty wizard who recruits teenagers that posses special traits. These traits should be able to make them become trust-worthy superheroes. Every Power Ranger pilots a colossal assault machine named Zord that changes its shape. Also, being about team spirit, the Power Rangers can unite their Zords and create a huge assault machine, named Megazord. The number of Power Rangers that appear in the TV series varies from 3 to 6. Their colors also keep changing; those that appear in every TV series are Red, Yellow and Blue. Also, the Red Power Ranger is informally seen as the leader of the group. Power Rangers are iconic for every 90s kid, representing the spirit of those times. Back then, friendship and team spirit were among the most important things for a kid. The Power Rangers franchise stresses exactly on these traits. The Power Rangers are, most important of all, friends. They can defeat evil only by acting as a team, a whole, thing caught by the existence of the Megazord which is, as I previously stated, a giant machine that incorporates all the Power Rangers’ Zords. Although being a team, each member has his own characteristics and super powers, which contribute to the unity of the group. 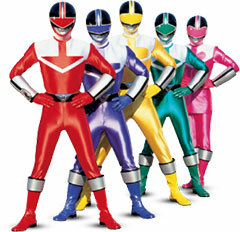 The colors of the costumes and their helmets are different; the helmets have different patterns, illustrating a different dinosaur which represents each and every Power Ranger. In what concerns the games’ popularity, one of the most popular games is the Power Rangers Samurai games. Other popular Power Rangers games for kids are Power Rangers SPD games which can be also played online, on various sites, Again, the importance of team spirit is underlined in every game. Those who want may also buy these games, such as the Power Rangers Samurai games, from various sites. So, my advice for you, if you want to have a good time, is to play the numerous Power Rangers games online. Each and every Power Rangers game, such as the Power Rangers Samurai game, is unique, has an interesting plot and could bring you the fun you want.